Colours have always fascinated people, but few have devoted decades to understanding how they interact with each other, and even fewer have tried to portray rays of light on paper. 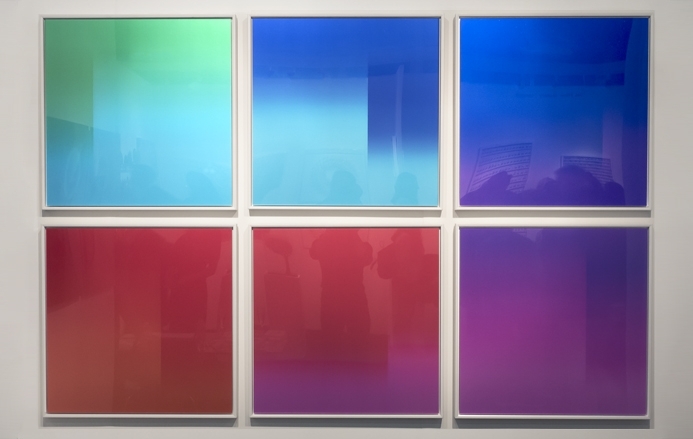 Jo Bradford is a self-proclaimed colourist who traps and documents colours at her studio in Devon, England, using a practice referred to as cameraless photography . Since her debut print series titled 'Autogenesis' launched in 2016, Jo Bradford is the most successful new artist represented by Eyestorm' in the past years. First exhibited in London in 2016, her colourful and energetic series of work has excited both collectors and photography enthusiasts. Last month her latest work 'Continuum' was released in London and New York and has instantly become an almost iconic edition. 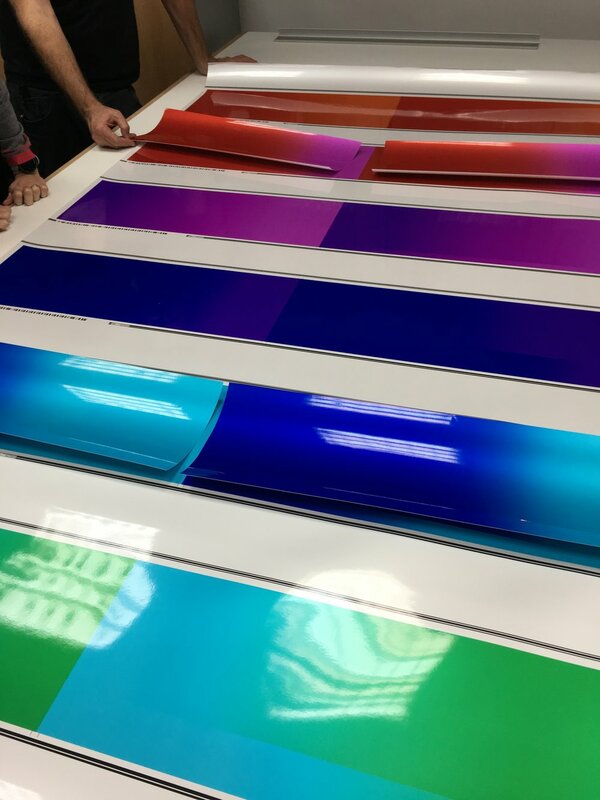 The series of six pieces explores the relatively unknown colours that lie in-between the main colours of the rainbow. This week's article on 'Investing in Art' gives an insight into Jo Bradford's work; through her striving for perfection and her passion for the exploration of colour, to creating beautiful and intriguing pieces of art. Jo Bradford has gained a sterling reputation in the art world for a very unusual and specialist art practice; experimental cameraless photography. She works with ‘alternative’ modes of photography where she doesn’t utilise any conventional equipment, lenses, or mechanised apparatus. In an age increasingly defined by technology, her approach is fundamental and pioneering in how we view and experience the intangible. From her darkroom on Dartmoor in Devonshire, this precisionist, recorder of light and self-proclaimed colourist, successfully traps and documents the colours present in rays of light. She directs beaming colour to light-sensitive paper during fleeting exposures made in the pitch black and has honed her cameraless practice over a career spanning two decades. With a Masters (Distinction) in the Critical Practice of photography, her work celebrates photography in its most simple and rudimentary form albeit via a highly intricate process of creation. Jo Bradford’s inspiration is colour theory and geometric abstraction which has roots in the lessons of Josef Albers who famously noted ‘there is no difference between science and art when it comes to creativeness’. Bradford’s photograms nod to Albers as they are nonfigurative rather than representational of any given object and draw on the laws of physics as well as art for their inception. In Bradford’s work with the prismatic colours contained within light that aren’t visible to the naked eye until ‘captured’ onto photographic paper, Her goal is to reveal the inner glow of the colour spectrum. The glorious hues achieved in Bradford’s work as well as the honesty of the technique have helped this artist become Eyestorm’s most successful newcomer since her debut with us in 2016. Bradford is always seeking to perfect her working methods in order to gain the upmost purity and luminosity of light, and her feat with the completion of her first exclusive series with Eyestorm, Autogenesis, has been a huge accomplishment for the artist. Autogenesis are among the most successful editions of 2016 and in 15 distinct hues and a small run of 15 editions, their breadth and colour-range covers more than double that of the standard rainbow spectrum. The series has been widely collected internationally. These painstakingly-made works bring the worlds of art and physics together and can be collected as a full set or individually. To own them is to partake in the artist’s mission to retain visual documentation of rich prismatic colour, for posterity, for the future, as much as for now. Camera-less photography is an art form that when created well, shows experience, deftness and persistence and we believe Jo Bradford is on a path which will establish her among the most skilled in her field. Her dedication, attention to detail and ability to achieve perfect execution are all evidence of her staying power in the art world. Her two stunning series with our gallery are not only pleasing on the eye but also have such strong conceptual credibility and her approach is recognised in the numerous accolades and awards already under her belt, including Arts Council England’s Creative Development Award and a Grants for the Arts Award, 2016. Today marks the launch of Continuum in the USA, with Eyestorm Gallery at the Affordable Art Fair. Managed to find time on my London trip to see the Josef Albers show that was in town at David Zwirner gallery. Quite a treat for a die-hard fan like me. I made a trip to London this week for the proofing of Continuum, my new edition for Eyestorm Gallery. We had a party in London to launch the three Elements works for Sir Terence Conran and Peter Prescott's Wine Bar, Lutyens, last night. Jo Bradford in front of the Elements Series at Lutyens Wine Bar, June 2016. My Autogenesis series of cameraless photographic prints appeared in the Times this morning in an article about the Affordable Art Fair in Battersea, London, which is on this weekend. The partial face sculpture being held in the foreground is by Shaun Brosnan. I am thrilled to tell you that Autogenesis will be on the walls with Eyestorm at the Affordable Art Fair in Battersea London this week. The private view is on the 9th March from 5:30-9:30pm and then the fair is open daily from Thursday to Sunday 13th March.